Fitness is a key aspect of cricket. A lot of international cricket is being played throughout the year, hence it’s important to manage every player’s workload and level of fitness monitored regularly. It is frustrating to see a lot of players getting injured and often out of international cricket for long periods, and sometimes having to hang up their boots at an early stage of their careers. Over the years, Sri Lanka cricket has lost the services of some top players due to injuries. Dhammika Prasad and Chanaka Welagedara are prime examples. Due to injuries, they had to be out of international cricket for a very long time, making it hard for them to return to the national side. 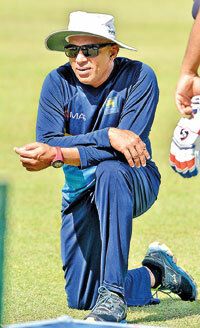 It has been an area of concern in the National cricket team for a long time now. With the World Cup (WC) on the horizon, it’s high time the Sri Lankan team management took some important decisions before Sri Lanka play their first match in the WC against New Zealand on June 1, 2019. During the National team’s 4-month sojourn overseas, when they toured New Zealand, Australia and South Africa, they were hampered by a series of injuries to key players, that effected the balance of the team. Since 2015, the fitness standards of the National team has been deteriorating drastically. According to Professor Arjuna De Silva, former Head of the Sports Ministry’s Sports Medicine Unit and also a former member of Sri Lanka Cricket’s medical team, there are some important areas that the National team has to look into, before leaving to England for Cricket’s showpiece event. “As the WC will be in England, adapting to conditions will be important, when touring a country such as England, by wearing clothes that will suit the temperatures. Areas like Radella are suitable for cold conditions,” he said. “Fitness levels need to be maintained from an early stage of their lives. The youngsters have to be advised that they need to have a balanced diet, before they come on to the cricket field. Their parents must be made aware of the amount of nutrients that needs to give them on a daily basis. These are the areas that we need to work on, in order to help the future generation have successful cricketing careers,” Prof. Arjuna said. Fitness has become a major talking point in recent years. In 2017, then Sports Minister Dayasiri Jayasekera criticized the standard of fitness of the National Cricket team, after their early exit from the Champions Trophy. Prof. Arjuna highlighted the fact that the intense workloads throughout the year have increased the probability of being injured. Furthermore, he went on to say that workloads have to be monitored frequently and adequate rest will enable them to play international cricket for a long time. Angelo Mathews is known to be an injury-prone cricketer. Prolonged injuries has kept Mathews out of international cricket in the recent past. Even though he is hopeful about his return to the team, his fitness is still a major concern for the Sri Lankan team management. Recently, there have been instances where some players who have been playing with injuries, have come into the team with a greater risk of being injured. He emphasised the fact that the team management has to advise players to skip some tours/tournaments to manage their workloads. According to the Professor, our players rush back from their injuries which worsens the injuries, and may take a long time to recover. “Unless they have fully recovered, they mustn’t play. The player must follow the advice of the Physiotherapist and the trainers, before they return to the cricket field,” warned Professor Arjuna, concluded that age and weight are also key factors when it comes to fitness. Well, it is about time that Chandika Hathurusingha and his management look to solve their problems, before they enplane to England, otherwise, his great dream of winning the WC will remain just that, or worse still, become a nightmare.